Chesapeake Energy Stock: Buy or Beware? Few stocks in oil and gas industry are more hotly debated than Chesapeake Energy . Former CEO Aubrey McClendon really seemed to live up to the wildcat reputation of a typical Midwestern oil man. Unfortunately, that never sat well with investors, and he recently rode off into the sunset by taking an early retirement. While a new leader has yet to be hired, the company that person will inherit is one that's still in transition. Should you buy the stock now knowing it has nowhere to go but up? Or is caution the better part of valor, with the best view being from the sidelines? What's so great about Chesapeake Energy? An investment in Chesapeake Energy is first and foremost a bet on the future of natural gas. The company is our nation's second-largest net producer of natural gas. Every year it pumps out 4% of our total natural gas needs. Furthermore, when you add in the company's vast partnerships, its gross production is almost 9% of our total annual output. Without the work of Chesapeake Energy, natural gas prices wouldn't be as low as they are today. While those low prices are currently a problem for Chesapeake Energy and investors in its stock, it does give a hint at its future potential. Demand for natural gas is heading higher, which over time should push its price up as well. In the future, that demand will come from a variety of new sources, including chemical and electrical production as well as an increase in the use of natural gas as a transportation fuel. This transition will fuel the company's near-term profits while a recovery in the price of natural gas will really boost the long-term value its stock. So, what's the downside here? The company's growth has come at a great cost, with too much of it funded by debt. If there's one recurring theme among smaller oil and gas companies it's that too much debt has been compounded by too much natural gas production. That's one reason why the stock of SandRidge Energy has been crushed over the past few years. That company is in the midst of its own turnaround and has been following the same playbook on liquids growth as Chesapeake Energy. However, that's not easy to do while also trying to get out from under the weight of debt. At last count, Chesapeake Energy had $12.6 billion in both senior debt and term loans outstanding, with an average maturity of less than five and a half years. That's not so bad when you consider that the company should produce more than $5 billion in operating cash flow this year if gas stays above $4. However, it's taking that money plus another billion and plowing it back into its drilling program. In order to make ends meet the company has turned to asset sales. It's already sold a slice of its Mississippian acreage to a Chinese company and is planning to sell its stake in the champion of natural gas as a transportation fuel, Clean Energy Fuels . 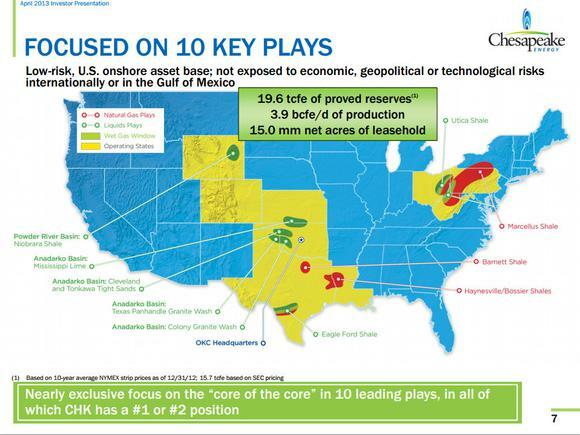 The problem with these asset sales is that everyone knows that Chesapeake needs the money, so it's not going to get full value for the assets. The bottom line is that you simply cannot run a company on asset sales alone, especially when a heavy debt load is behind those forced sales. Until Chesapeake Energy can live within its cash flows, the company's stock will likely be weighed down. Chesapeake Energy is one of those companies that comes with both great risk and the potential for great reward. If you're the type of investor that likes that type of scenario, then buying Chesapeake Energy's stock might be right up your alley. However, if risk isn't something that allows you to sleep at night, you're better off just watching this one from the sidelines. The story is still really compelling as energy investors would be hard-pressed to find another company trading at a deeper discount than Chesapeake Energy. Its share price depreciated after negative news surfaced concerning the company's management and spiraling debt picture. While the debt issues still persist, giant steps have been taken to help mitigate the problems. To learn more about Chesapeake and its enormous potential, you're invited to check out The Motley Fool's brand-new premium report on the company. Simply click here now to access your copy. The article Chesapeake Energy Stock: Buy or Beware? originally appeared on Fool.com. Fool contributor Matt DiLallo has no position in any stocks mentioned. The Motley Fool recommends Clean Energy Fuels. The Motley Fool has the following options: Long Jan 2014 $20 Calls on Chesapeake Energy, Long Jan 2014 $30 Calls on Chesapeake Energy, and Short Jan 2014 $15 Puts on Chesapeake Energy. Try any of our Foolish newsletter services free for 30 days. We Fools may not all hold the same opinions, but we all believe that considering a diverse range of insights makes us better investors. The Motley Fool has a disclosure policy.